Christmas this year is even more special because we’re in our new home, and mini me is at the age where she is even more aware of the holiday. Homegirl had a circular carrying around with her telling us (and anyone who’d listen) about things she wants. She goes crazy over holiday decorations, especially the lights, and she even has her own Christmas tree, which she decorated. This year, since she’s more involved with the holiday, we decided to do something a little differently by creating a Christmas Eve Surprise Gift Box to gift mini me this Christmas eve. Hopefully, this will become a new, ongoing tradition in our little family. 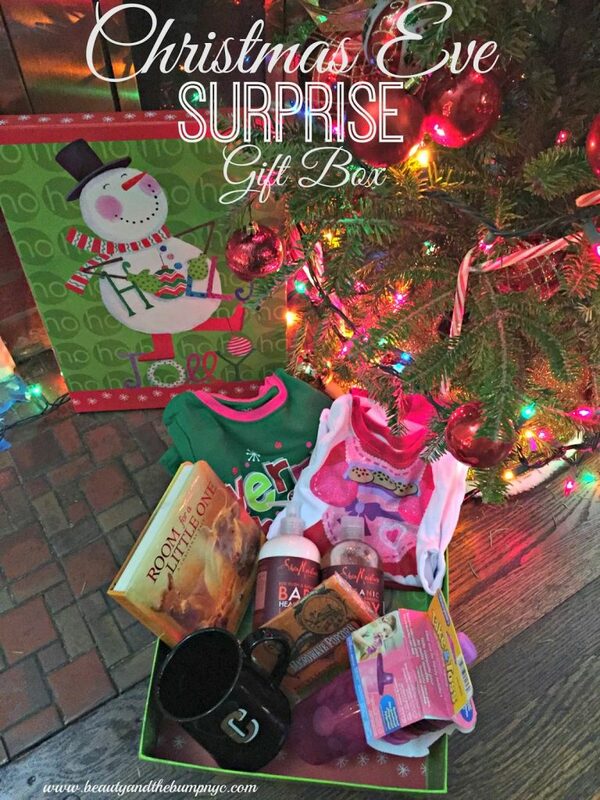 What is a Christmas Eve Surprise Gift Box? I spend a lot of my time on Pinterest. While perusing, I came across the idea for a box to gift your children on Christmas Eve that’s filled with different items of your choosing for your kids to enjoy. These things can include a holiday movie dvd, popcorn, new pajamas, a letter from santa… anything. Just have fun with it! What will our Christmas Eve Surprise Gift Box Include? Last year, we gave mini me two books that were about the true meaning of Christmas because we wanted her to learn from an early age that Christmas just isn’t about gifts, and there’s a bigger and deeper meaning. Following in that tradition, we picked up Room for a Little One: A Christmas Tale from Amazon, which will be read along with God Gave Us Christmas. Before she puts on her new PJ’s she’s going to get a bath just like any other night. We picked up some of our favorite kids bath products from the Shea Moisture Baby Line. Instead of going with our old fave, the Olive & Marula formula, we got her the Red Tea & Babbasu Body Lotion & Head to Toe Wash.
Mini me loves clothes. New PJ’s for her to sleep in on Christmas Eve is going to be exciting for her. Plus, when she’s opening her presents on Christmas morning, she’s going to be festive, and so fresh and so clean in her new Christmas pj’s. Yes, mini me still uses a sippy cup (keep your opinions to yourself). She’s chewed up the tips of the spouts on the cups she has so the new ones will be great to breakout on Christmas for her to drink her warm strawberry milk. Plus, she can’t bring in the New Year with raggedy cups. She loves popcorn. According to her uncle, “She even ate the kernels.” Now, that’s true popcorn love. We’ll probably end up watching one of her shows together as a family (as usual). I picked up a cute ‘C’ monogrammed cup for her. She loves sipping on tea. I just thought it would be cute to throw in. Plus, I picked up an additional two – the letter’s ‘K’ and ‘D’ – for both my husband and myself. We’ll be sipping on some tea or mint hot chocolate, while watching Disney Jr. or Sprout T.V. Either the husband or I will write a letter addressed to mini me from santa telling her that he knows how good she’s been this year, and he can’t wait for her to see what he’s gotten her in return. He’ll go on to hint that he’d like some cookies and milk waiting for him. And finally, remind her to give her parents extra hugs and kisses for all of their hard work this year. I’ve already made the chocolate chip cookie dough for Santa’s cookies. Mini me helped me make it. On Christmas eve, we” bake them and leave out some milk (or beer) for Santa to enjoy. Overall, I think this will be fun, and help create a new experience and special memories. Have you ever made a Christmas Eve Surprise Box for your family?